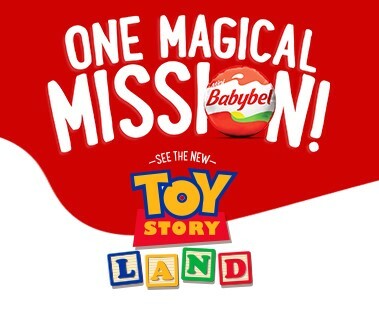 Babybel cheese wants to save snacktime, so they are giving one lucky winner an all expenses paid trip to a Walt Disney World resort! Lots of other instant win game prizes are up for grabs, too, so be sure to enter daily for your chance to win! Grand Prize (1): A six (6) day / five (5) night vacation package to the Walt Disney World® Resort for Sweepstakes winner and up to three (3) guests, including room tax) for five (5) consecutive nights at a Disney Moderate Resort at the Walt Disney World® Resort selected by Sponsor in its sole discretion; based on availability;  if Sweepstakes winner’s residence is located more than 250 miles from the Walt Disney World® Resort, up to four (4) round-trip coach airfare transportation tickets;  up to twenty-four (24) 1-Day Magic Your Way Tickets;  one (1) $750 Disney Gift Card for use while at the Walt Disney World® Resort (subject to restrictions); and  a $2,000 check made payable to Sweepstakes winner. The ARV of the Sweepstakes Prize is $12,366. This Sweepstakes ends on 09/30/18 and you can ENTER DAILY to win.